This past Friday (July 8, 2011) was Chick-fil-A’s annual “Cow Appreciation Day” in our area, and I’m assuming across the world. If you dressed like a cow you got free food. A partial costume would get you an entree’; a complete from head to hoof costume would get you a whole meal. Free food motivates me (WELL, I guess I’d go so far as to say, most any kinda free STUFF motivates me – a penny saved is a penny earned kinda thing I guess) so my children and I undertook the task of making costumes for the four of us. We also got our neighbor in on the act. 5) Then we cut out the ears and nose also from the above link. 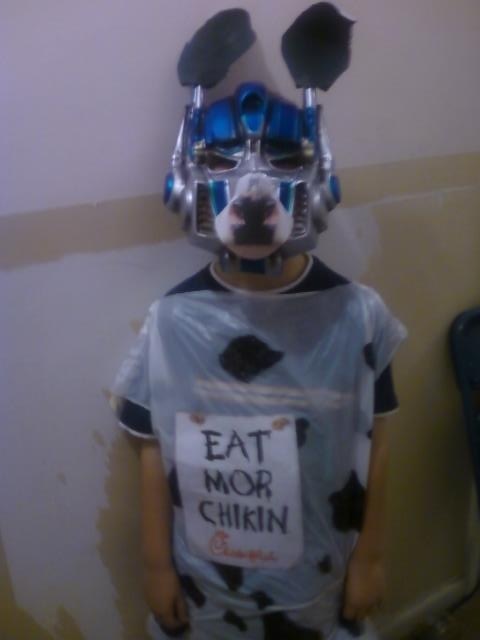 6)Aaron added his nose and ears to his Optimus Prime – Transformers halloween mask. 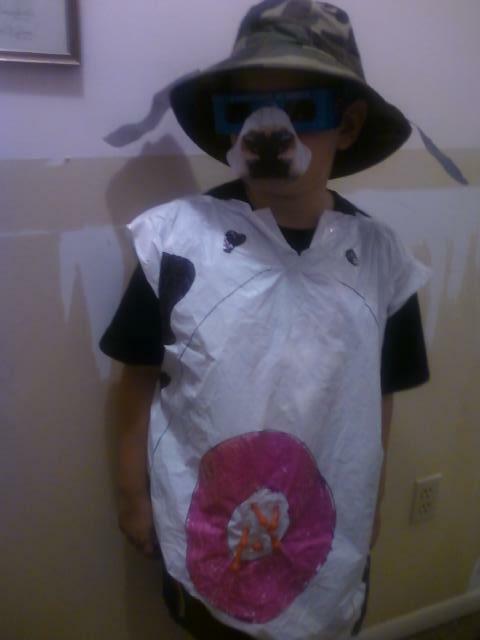 6) Micah added his nose to Monsters vs. Aliens 3-D Glasses and stapled his ears to his camo hat. We had a great time making our costumes, and even more fun eating free food because of our efforts. Any retail market that has the audacity to give away free stuff is gonna make boo-coo’s of money – because people associate ‘FREE’ with: 1) good times, 2) good value, and 3) good feelings. All of which make for REPEAT cutomers, and that’s always good for business. If you would like to see our other photos, you can go to https://www.facebook.com/motherof2angie?sk=photos#!/media/set/?set=a.1810180020916.2088448.1432441977. Dad, however, opted out of the photo shoot, so there are none of him in the album.